Easily identified by the black and white striped tail. The Western Diamondback Rattlesnake, a pit-viper, is Arizona’s largest rattlesnake (up to 66 inches long). Gray to tan with “salt and pepper” flecking throughout and brown diamond-shaped blotches on the back. The tail has conspicuous alternating black and white bands of similar width just prior to the rattle (see photo). Western Diamondbacks are usually seen moving March to October, but they are expected to be active around their dens during other months, especially in late winter. They are mostly nocturnal, but are also markedly diurnal during fall, winter and spring. Mating probably occurs mainly in the spring and fall. The young, who are born alive with a single button in their tails, first appear in August; the rapidly growing juveniles may greatly outnumber adults on the roads for the remainder of the season. Within the Sabino Canyon Recreation Area, the Western Diamondback is primarily a resident of the bajada (the alluvial fan formed where the canyons run out of the foothills), but it is also found in the gently sloping foothills bordering the bajada and on the broad floor of the lower reaches of Sabino Canyon. This snake has not been seen in upper Sabino. Black-tailed and Tiger Rattlesnakes are found in upper Sabino. 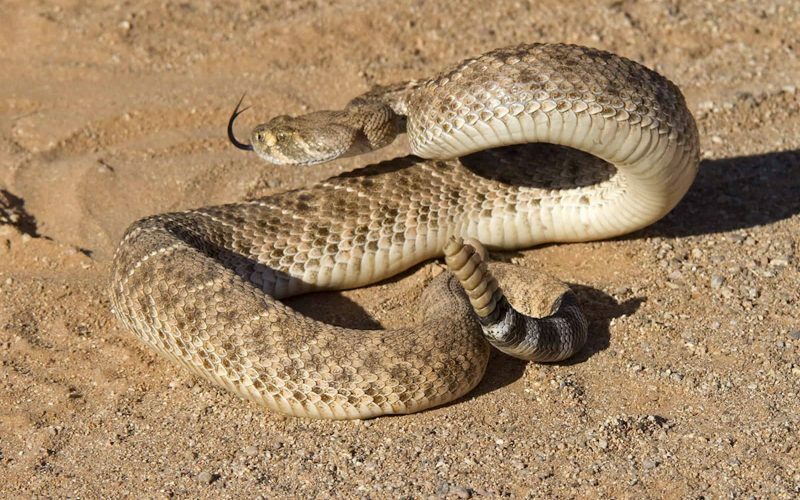 In the unlikely chance that you are bitten by a rattlesnake, do not attempt any type of first aid other than removal of any jewelry near the bitten area, and head immediately for the nearest hospital emergency room. It is best to call ahead if possible. This photograph was taken in April 2008 in the bajada near the Visitor Center.